I just received my first month and it was STUFFED with so many beautiful zines and little gifty things. I just loved it so much. If every package is this good I'll be a subscriber for a long, long time. Received my first box last week and I love what I got! A great mix of whimsical, meaningful, and artistic. Can't wait to add to my collection. I really love zines. I was really never able to find them anywhere or knew where to purchase them. This is a great way to start my zine collect. I’m so glad I found it. You receive quite a variety. There's always a surprise and they're well written. They come in all different sizes. The zines were so creative and funny and really good quality. Honestly the best. I really enjoyed the service. I'm not in the position to continue my subscription after a few successful months with it, but I plan on returning to it soon. Really great zines, and the quality of them started getting better as they got with bigger distributors, too. Love this subscription. Every month the zines are unique, plus as mentioned you get extra stuff like stickers or postcards, etc. Definitely worth a try. I've tried many different monthly subscriptions over the past few years (beauty boxes, artisan boxes, etc.) but I can honestly say this one is my favorite so far. The zines selected are very original, and I love the little extras included each month like a tarot card or random stickers. 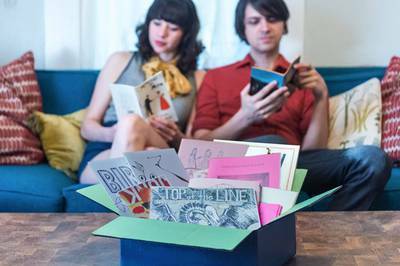 If you are artsy, quirky, or just enjoy surprises, this subscription is for you! Highly recommended. I love this sub. Sure it doesn't come in the box(and honestly who needs more boxes laying around), but it's a really good value. Anyone who collects zines knows they can get a pricey due to printing. This is a great value though. I recommend it. I will def be keeping this sub as long as it is a thing.